Add $2.95 for a small fries. ﻿Daly Burgers on Corydon doesn’t take reservations but we had no problem sliding around tables so eight of us could sit together. It’s counter service and the menu’s pretty straightforward so it didn’t take us long to order. The staff were all smiles and the food came quickly, but all on two trays put down for us to sort out. There were no plates so we ate off the wrappers off the table - it’s a diner. Once again most of the crew had some variation of a Fatboy (called “Deluxe” at Daly Burgers), a couple of diners had a cheeseburger and I had a bacon double cheeseburger. 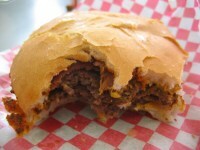 The meat patties were hand formed and large, seasoned nicely and juicy. Like Original Georges, they weren’t too dense or soft - they were just right. The chili sauce had some nice zing to it and the flavour came though, although one diner said there could have been more chili. There was also lots of cheese - a small complaint about the Original Georges burger. ﻿I had a double burger, as did another diner, and we both agreed the burger to bun ratio was correct. People having single burgers said there was too much bun. One diner was left holding a large piece of empty bun after getting about 2/3 of the way through. 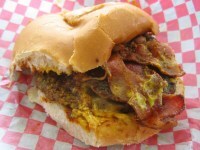 ﻿ The bacon cheeseburger didn’t come with lettuce or tomato (and rightly so) and I ordered it without pickles or onions. It was all about the burger and I really enjoyed the flavour. My bacon-double cheeseburger was not at all a sloppy burger but the deluxe were a bit messier. 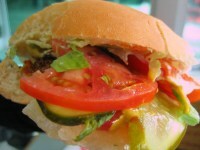 The lettuce and tomato on the deluxe burgers were “fresh and large”. 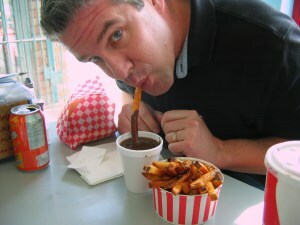 If you order gravy it comes in a Styrofoam coffee cup - lots of it. As one diner put it, the gravy was so thick it was almost sliceable. We’re already famous in our own eyes and a female diner (we’ll call her Esther) had a signed 8 x 10 glossy photo of herself for a male diner (we’ll call him Brett). Table space was at a premium so glossy Esther ended up spending lunch face down in Brett’s lap. Interestingly though, whenever she fell off, she landed face up. I've been here numerous times, always a disappointment. Chili sauce is way too salty and the patties are dried out. I keep telling the cook not to squash out the juice when they flip them but it has become a bad habit. Said it cooks faster - ya, and drys it out. Prices are way too high, these are not premium burgers and the fries are inconsistent. The gyros are a bad salad with strong, not sweet onions and a hint of meat. The comment above was about the Pembina location and their food does not resemble your review. The paddies are not hand formed or as large as in your pics, they seem to use frozen. I wonder why the name is the same? 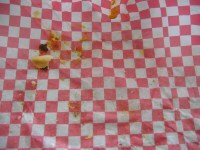 I was at Daly Burgers on Corydon yesterday and my meal was great. The bun to meat ratio was perfect. I eat there once a week as I work near by. I have never been disappointed.